We have all dealt with ankle and foot pain in the past. Most of us don’t spend a whole lot of time thinking about tendons, muscles, and other parts of our feet. But if you study biology or human anatomy, you need to be able to identify different parts of an ankle or foot. The Ankle & Foot Pro III is a sophisticated app that helps you study those parts on your phone. 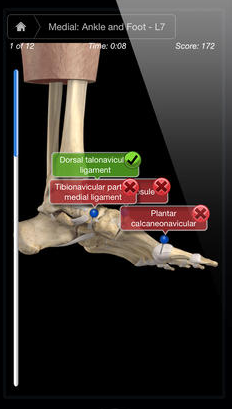 The Ankle & Foot Pro III app provides you with a 360-degree 3D view of the foot and ankle. You get 200 images, 28 animations, and over 160 audio pronunciations. You get multiple 3D sections and can cut away different layers to the bone to learn more about the foot and ankle. Users get to draw on any image and share it with others. The app not only has multiple layers, it also lets you make layers semitransparent to compare them. You also get to post notes. This is a premium app.